Our yummy Moodylicious Children's Spa Perfume Lotion Candle comes in an array of delicious perfume flavors like Cotton Candy, Bubblegum, Pina Colada, Chocolate, Wacky Watermelon, Salt Water Taffy, just to name a few. Nestle in our white logo ice cream containers,mending Soy Wax or Paraffin Wax, Shea Butter, Cocoa Butter and Jojoba Oil for a cleaner burning eco-friendly candle. 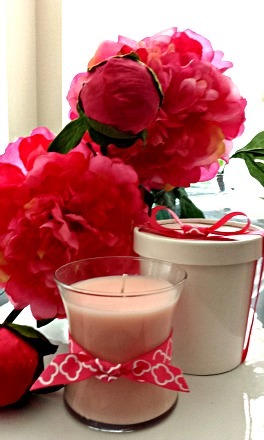 Hand-poured in our signature hour glass candle holder is like a "bottle of perfume in every candle". Gently moisturize your skin with our naturally fragrance blended lotion candle, just smooth your finger round the top of our signature perfume candle (while candle is not burning) dab a little of the soy wax on your wrist and neck for a delicious scent. Can be used as a hand and body moisturizer also....it's like having 3 spa products all in one. * We use Organic Essence (Essentical Oil) in our Baby Bella, Teenylicious, Sunshine Naturals Hair Treatments, Moodylicious, to which our spa line is Not deemed organic.